It’s a star-studded lineup of artists at this Friday’s North Omaha Summer Arts Crawl. Stroll or drive to five venues (listed below) near and along North 30th Street. 6-9 pm. Food and beverages served at each site. It’s all free. For details, visit www.facebook.com/NorthOmahaSummerArts or check out the Facebook Events page for the Arts Crawl post. Church of the Resurrection, 3004 Belvedere Blvd. 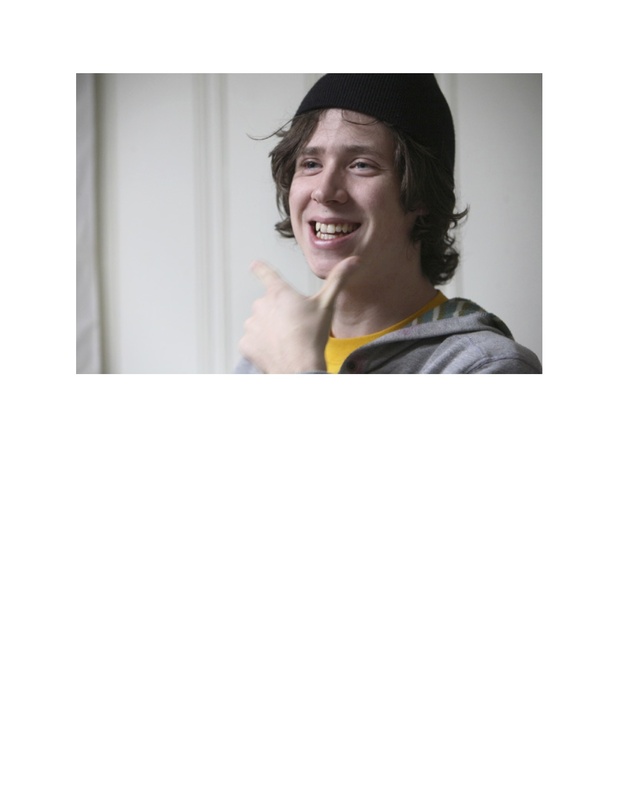 At some venues artists will be on hand to discuss their work. Free food and beverages will be available at each stop. For more information, call 402-502-4669 or 402-445-4666. Please share this info with family, friends and coworkers in support of this grassroots community event that enriches and engages North Omaha with art. 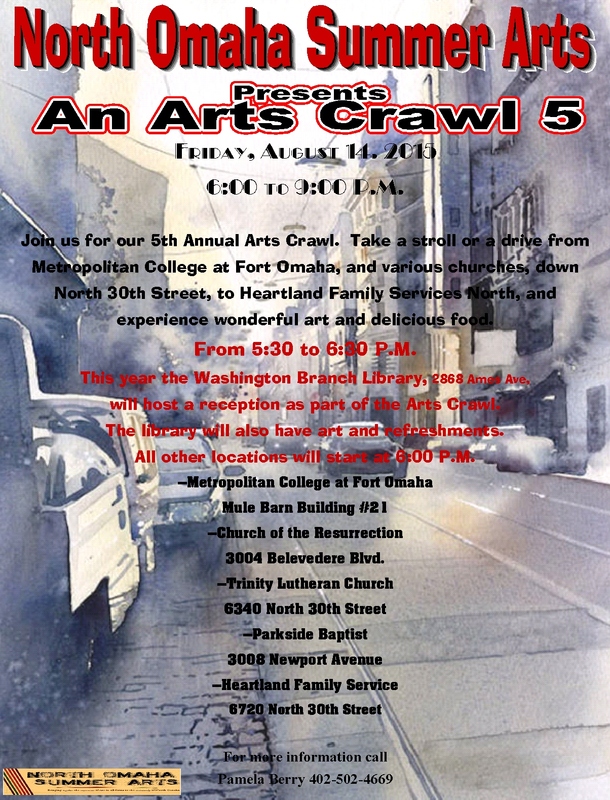 Arts Crawl Concludes North Omaha Summer Arts; Friday, August 8 from 6-9 p.m.
Arts Crawl Concludes North Omaha Summer Arts – Friday, August 8 from 6-9 p.m. 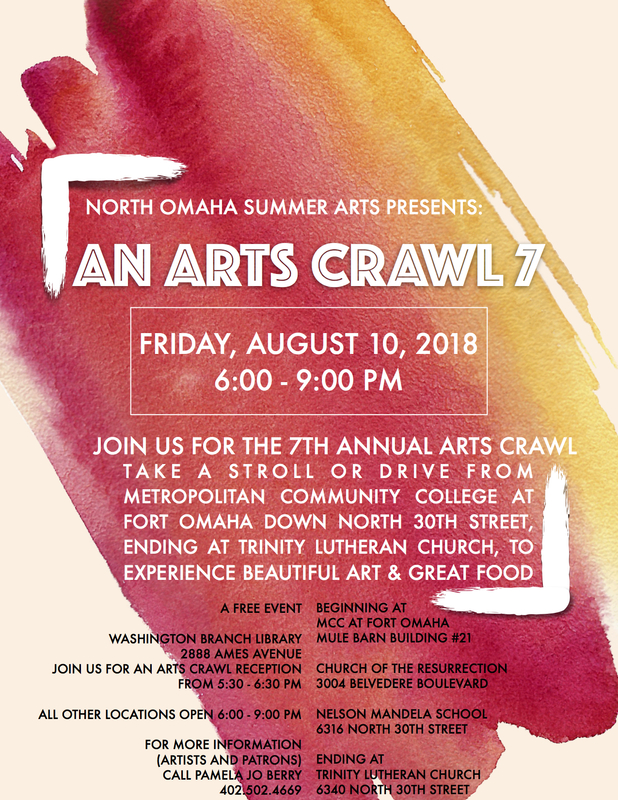 Please join us for the conclusion of North Omaha Summer Arts (NOSA) at an Arts Crawl on Friday, August 8 from 6 to 9 p.m. Take a leisurely stroll or drive to sample a wide variety of visual and performing art at venues up and down a stretch of the North 30th Street corridor. 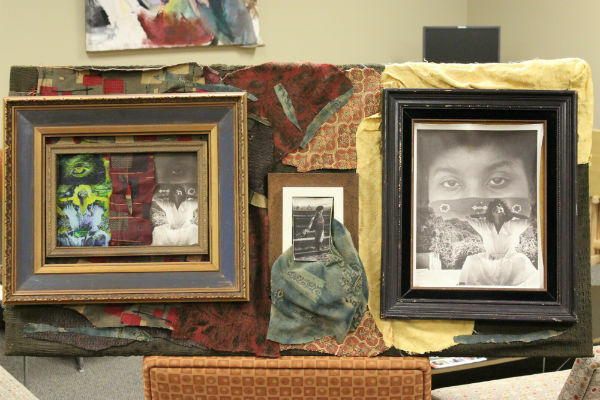 NOSA founder and director Pamela Jo Berry, who resides in the area, saw a need for more art in her underserved community and formed the annual North Omaha Summer Arts as a response. The free, summer-long festival, now in its fourth year, held a women’s writing workshop and an outdoor gospel concert earlier this summer. The Arts Crawl is the festival’s traditional culminating event. For more information, visit www.facebook.com/NorthOmahaSummerArts or call 402-502-4669 or 402-445-4666. Details coming regarding the featured artists. When I first posted this, I wrote about the subject of this story, “Pamela Jo Berry is a photographer who doesn’t like her picture taken.” I could have added that she also doesn’t allow her picture to be used without her permission. That’s still true but she has since relented to let me post a self-portrait she created. The fact that we’ve became a couple since I wrote this story may help account for this change of mind. She’s still very shy and particular about her image. What you will see in this self-portrait, which is broken up into two images here, is her heart. The mixed media artist displays her big, warm heart in everything she does, including the North Omaha Summer Arts festival she just dreamed up herself and has staged three consecutive years now out of her own pocket and with in-kind donations from friends, fellow artists, and supporters. 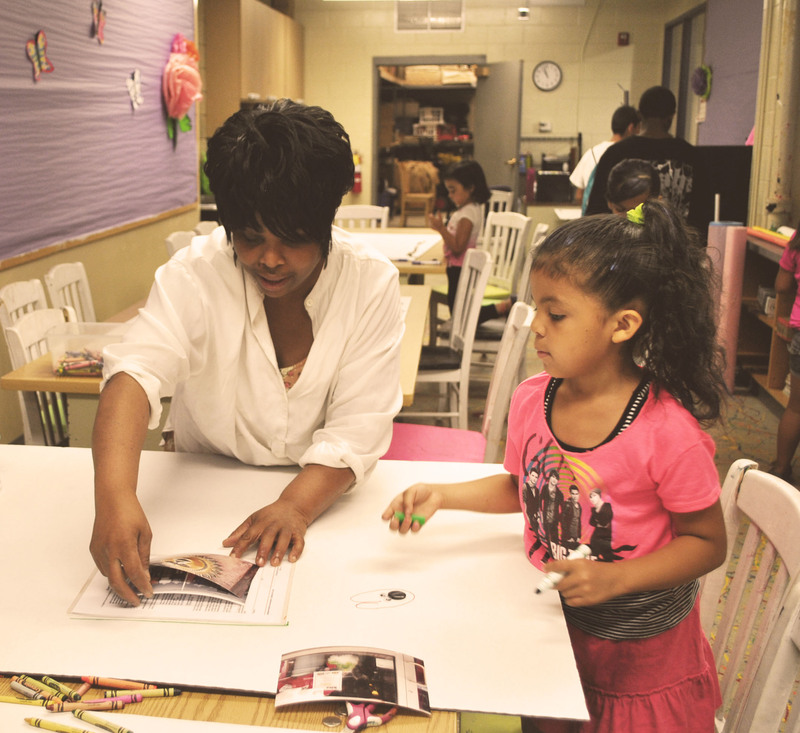 The grassroots event is very much an expression of her passion for art in all its many forms, her deep spirituality, and her abiding love for her North Omaha community. As always, this year’s featival culminates in an Arts Crawl up and down a section of North 30th Street that not coincidentally is also her neighborhood. The crawl runs from 6 to 9 p.m. and Berry’s organized an eclectic roster of artists to show their work. Berry’s done something here that should be a lesson to us all. She saw a need for more public art in her community and instead of bemoaning its absence she went about creating a festival that brings art there. Pamela Jo Berry saw a need for more art offerings in the section of northeast Omaha where she resides and decided to do something about it. “It actually came about as wanting to put a taste of art in the area,” she says. This year’s festival has already seen: a Creative Writing Journey for Women workshop series taught by best-selling romance novelist Kim Whiteside (who publishes under Kim Louise) of Omaha; and a Free Motion Quilting course taught by former Union for Contemporary Art resident Shea Wilkinson. A free home-cooked dinner was served before each class. The June 22 gospel concert at Miller Park featured the Cadence Ensemble, Highly Favored and Eric and Doriette Jordan. Blessed Sacrament Church, 6316 North 30th St.
Trinity Lutheran Church, 6340 North 30th St.
Jehovah Shammah Church International, 3020 Huntington Ave.
Parkside Baptist Church, 3008 Newport Ave.
Solomon Girls Center/Heartland Family Service, 6720 North 30th St.
Other artists featured in the Arts Crawl include: Whiteside, Wilkerson, Peggy Jones, Linda Garcia, Reginald LeFlore III and Gerard Pefung. Berry’s also showing her own work. It’s only natural for Berry to utilize churches because she’s a deeply spiritual woman who sees the festival, like her own artwork, as a faith-led mission. She sees NOSA as a much needed asset for an underserved community challenged by poverty, crime, scarce amenities and a perception problem. Nebraska Arts Council Heritage Arts Manager Deborah Bunting says NOSA is part of the new energy and sense of community being built in North O.
Berry, who works with Omaha Community Playhouse education director Denise Chapman in organizing the fest, says while the number of people who engage with NOSA is still small it positions North O as a place of beauty, creativity and potential. Berry, who regularly attends Trinity Lutheran, says her pastors, Revs. John and Liz Backus, “have been very supportive” as have pastors at other churches she’s enlisted. John Backus admires Berry’s efforts. Berry says her decision to create NOSA was much like her decision 20-plus years ago as a young single mother to make art her life. She succeeded too with commissions, exhibitions, Nebraska Arts Council residencies and a Mid-America Arts Alllance fellowship. Just as her art career got in full swing a series of challenges, including a chronic illness, interrupted her plans. It’s taken time for her to learn to budget her energy. She’s producing and exhibiting again. 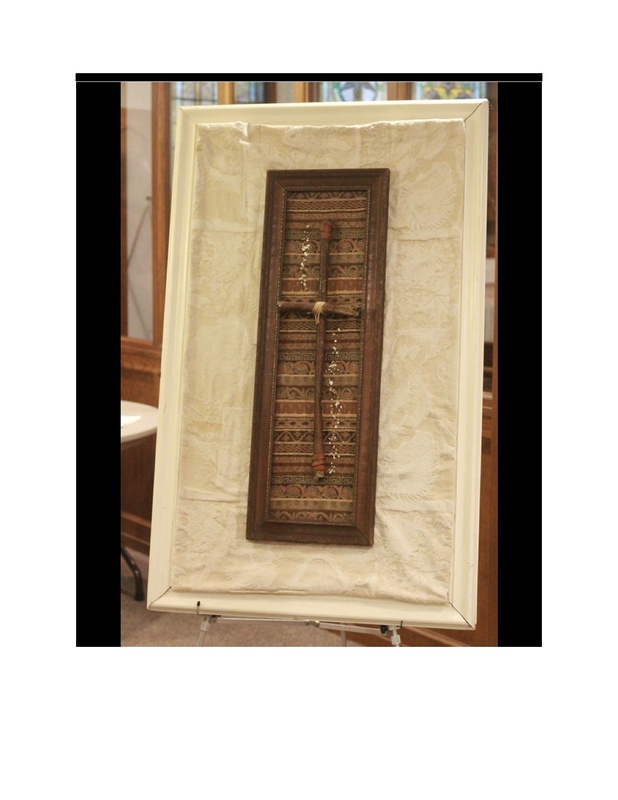 She currently has a show of mixed media work in the Mulitcultural Affairs office at Creighton University’s Harper Building. Where she used to be consumed trying to make things perfect, she says she’s now fine keeping imperfections in her work. 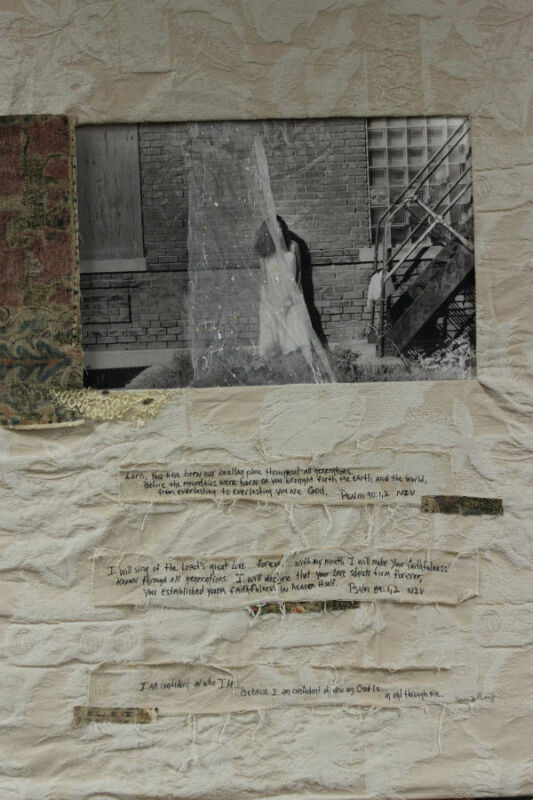 Her mixed media piece “Change” includes a torn photograph she views as a metaphor for the permutations life holds. That same easy attitude infuses NOSA. Berry appreciates that after a long lull the 24th and Lake Street hub is alive with arts activities again thanks to Loves Jazz and Arts Center, Carver Bank, the Union for Contemporary Art and the Great Plains Black History Museum. NOSA fills a gap further north and offers programs the others don’t. She likes that NOSA has a quirky, do-its-own-thing vibe. In putting NOSA together Berry calls on fellow African American female creatives. Berry likes that she and her “sisters” produce a festival that not only gets people to experience different forms of art but that gives them a chance to create art and to get it seen. Students in the creative writing class pen pieces published in an anthology and students in the quilting class get their work shown in the Arts Crawl. For Berry, it’s all about giving North O its due.